-Touch the switch again, become interval spray mode (spray 2 seconds and then stop 2 seconds, become a cycle), which can work 10-12 hours. -Press and hold the switch 1.5 seconds again, turn off the light. -Wipe the spray mouth with a cotton swab with vinegar to prevent scale-forming. -Please wash water tank and change water everyday to avoid breeding of bacteria and virus. -Don't add perfume into water which can effect the humidifier to work normally. Don't add essential oil which can cause humidifier damaged easily. [Small size, light weight] NEWCOSPLAY personal air humidifier Size: 3 * 3 * 5.9 inches, suitable for small size space, mini bedroom, baby, children's living room, or convenient to carry to mini office, car or travel. [Accept mineral water and tap water] is only applicable to mineral water and tap water. Essential oils, perfumes, distilled water, purified water and other liquid medicines are not accepted. [2 Fog Mode] The touch switch turns on the continuous spray mode and can continue to work for 3-4 hours and then automatically turn off. Touch the switch again and enter the intermittent spray mode (spray for 2 seconds and then stop for 2 seconds to become a cycle) and can work for 7-8 hours. Touch the switch again to turn off the spray. 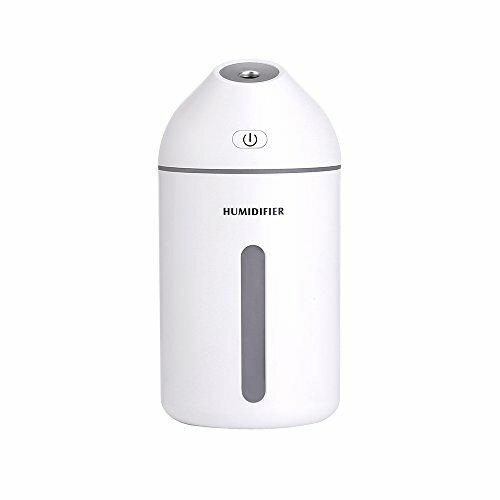 [USB Charger Power] The air humidifier can only work under power, such as USB adapter (500mA-1A), computer USB interface, laptop, mobile power supply, etc.